Tobias Carroll has been very busy. In August, he released a short story collection, Transitory. Last week he launched his debut novel, Reel. 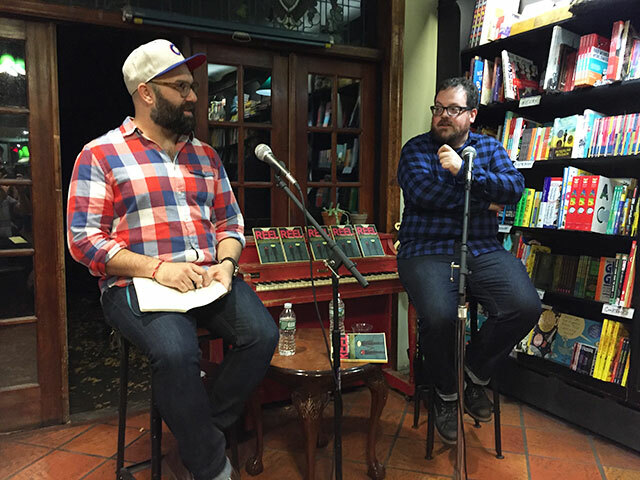 Carroll was at Community Bookstore in Park Slope to discuss the novel with Jason Diamond. The two are close friends and together they built literary web magazine Vol 1 Brooklyn into a powerhouse of culture. The first chapter of Reel took a long time to write, Carroll says. He had the idea of these two people meeting at a show and wanted to explore how that would play out but the story wasn’t working. He took a trip out the Pacific Northwest and decided to set a novel there. It was a way to get his characters and his mindset out of the tri-state area. He grew up in New Jersey and now lives in Brooklyn. By 2010 Carroll was working on the novel with his writing group. He decided he would just start bringing chapters of the novel to group workshop. The novel progressed, but Carroll was also writing short stories. Civil Coping Mechanisms, the publisher of Transitory, had an open reading period. He submitted his story manuscript, and was also in talks with Rare Bird to publish the novel. By coincidence, both presses set a release just months apart. Like many writers, Carroll also has two books sitting in a drawer. One of those, he explains, didn’t work becuase it was overplotted. It was a very New York book, he says. In a way, Reel was the opposite of that. Carroll spent a number of his younger years running a record label, so he has a strong background in music. That comes through in Reel. One artificial restraint he created for himself was only including bands with two-word names. This excluded references to a number of bands he likes, but he had the idea to limit himself and decided to run with it. Now he is revising a novel that also relies on band names, but this other book is all invented bands. Another music related part of Carroll’s past was his interest in music zines. The zine and DIY culture helped teach him the importance of being self taught. He recalls also how one member of a band he wrote about then has since taking up literary writing and has written for Vol 1 Brooklyn. Carroll is also a voracious reader. He says he reads anywhere from four to eight books a week. For the last two years he has been doing primarily freelance work, which means many of the books he ends up reading are for one job or another. He does try to pick assignments that focus on books that interest him, but he doesn’t always have that luxury. One reason he is able to read so much is that he has come to understand his own reading habits. If he gets bogged down in a longer, slower book, he’ll pick up something fast and snappy to get his pace back up. All of the reading means Carroll is a natural critic and he has written quite a lot of contemporary literary criticism. He says though that he finds fiction can be more of a challenge. With criticism, he can simply maintain a neutral voice and that simply isn’t the case in fiction. “I wish I was getting more done,” he says. His next book–or at least the book he is revising now–is set in a fictitious New Jersey town. Growing up in Central New Jersey, Carroll frequented New York City. It was ever present. He sees a certain romance driving up and down route 18. “My relationship with New York is incredibly colored by my relationship with New Jersey,” he says.